When Tommy Brock kidnaps baby rabbits and plans on eating them for breakfast, Benjamin Bunny and Peter Rabbit must come up with a plan to rescue the babies. To their luck, Mr. Todd and Tommy Brock get into a fight and forget the breakfast. 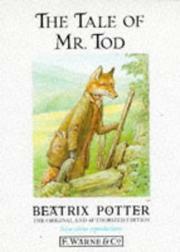 Potter, Beatrix, “The tale of mr. todd,” Children's Picture Book Database at Miami University, accessed April 18, 2019, https://dlp.lib.miamioh.edu/picturebook/items/show/9415.